If Chris Waller was hoping to settle his nerves a little less than half an hour before saddling Winx, then he chose the wrong colt in The Autumn Sun to do so. Australia’s most valuable three-year-old in training, The Autumn Sun was sent-off a red-hot favourite to continue his winning streak in the Rosehill Guineas. He emerged unscathed and secured victory number eight – his fifth at Group 1 level – but he had to master a determined Arrogant following a sustained dual, and even then the margin was only a neck. The pair pulled two lengths clear of Chapada in third, completing a two-three for trainer Michael Moroney, whose positive pre-race bulletin was entirely vindicated with a brace of high-class performances, while New Zealand Derby fifth Surely Sacred ran a gallant race in fourth as the field came home at wide intervals in what proved a searching staying test in trying ground. Despite The Autumn Sun gaining a reputation as a heart-stopper – his last-gasp Randwick Guineas success paying testament to that – he continues race-by-race to deliver the goods. And it is surely the sign of a class-laden colt that he is able to win in unsuitable circumstances, bolstering a career record that contains only one blemish from nine outings – a fourth-start defeat in the Stan Fox Stakes at this course in September. Waller cut a relieved figure in the post-race debrief, paying testament to both The Autumn Sun and co-owner John Messara, the Arrowfield Stud principal who sold the colt for $700,000 at the Inglis Sydney Easter Yearling Sale in 2017, but made a major investment into the son of Redoute’s Choice following his Golden Rose Stakes win in the spring. "Mr Messara is a good sportsman and that is why he is here running," Waller told Sky Racing following the first of five top-tier contests on the card. "There was some concern during the week if he should be running on a heavy track, because he’s still a horse who isn’t fully mature. "It was through his sportsmanship that they brought him here and he’s a very good horse. That was a good test – the last 200 metres – and the inside horse was laying all over him, but he didn’t lie down and he’s a really good horse." Waller also paid compliment to the constitution and attitude of The Autumn Sun, a colt with ‘so much speed’ having made a successful debut over 1200 metres at Rosehill in April. 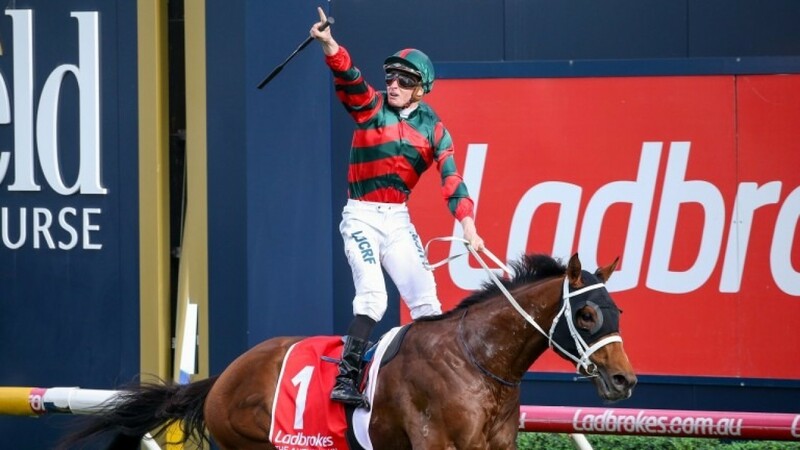 "I could see as soon as they went 400 metres it was going to be a really tough staying test and just look at the margins at which the runners have come home – it was pretty close between the winner and the second, but in behind there were some really tired horses," Waller continued. "For a horse who has shown so much speed – he almost ran the track record at Randwick first time out over 1,200 metres – we were really testing him today over 2,000 metres and he’s done it." Ridden by James McDonald, New Zealand Derby winner Crown Prosecutor played a significant role in creating that test, stringing out the 12-strong field – which had been reduced by one following the defection of Madison County – down the back straight. The Autumn Sun adopted a midfield pitch having broken nicely under Kerrin McEvoy and he made his move three-deep passing through the 400-metre marker, nosing his way to the front at the 300 and looking like he would quicken away with authority. However, Arrogant lived up to his name and proved a determined opponent under Craig Williams, jostling all the way to the line and only succumbing in the closing stages. Speculating on future targets for The Autumn Sun has proved a popular game amongst the media merry-go-round as the colt’s profile has continued to swell, and while international targets remain a possibility – he was this week handed nominations in the Champions Mile and the QEII Cup at Sha Tin on April 28 – Messara continues to cut a level-headed figure when looking ahead. "He knows how to win, but I don’t think he enjoyed it," Messara told Sky Racing. "He got away with it, but good horses can do that. "It’s a pity it wasn’t a good track because that would have told us a lot more about the horse, but on a wet track and the first time over 2,000 metres it was a big ask and he came through it. "Race-day decisions are not good decisions. I’m going to cool down and have another few looks at that race, but I know he didn’t enjoy it – he made a long, sustained run and he was labouring at the end. But he got there – and that was pure guts."